You know it’s going to be a good episode of Hannibal when the “viewer discretion advised” warning stays on the screen for a realllllly long time. And that was quite a ride, huh? I felt like Will by the end of that episode — quite knocked off my feet. Everyone is looking for Hannibal. Mason Verger has set up a hotline and has a bounty on Hannibal’s head, with Alana’s help. Will and Chiyoh are on a train to Italy in search of him. Jack has crossed oceans, and Inspector Pazzi continues the search from his past for Il Mostro. Will and Chiyoh were the closest emotionally with Hannibal, as they were both under his influence. But they are the two who are the farthest physically from him on their train to Italy. They are in a sleeper car, and they look like they are lying in coffins as they lay down to sleep in the narrow beds. Will wakes up with a nightmare that Chiyoh is nailed to the ceiling with stag antlers — and for a second I fell for it. I always do, at first. Chiyoh says that nighttime is when your life is most like a dream, and on Hannibal that dream state never fully lifts. So when she threw Will off the back end of the train in the first OMG moment of the episode, I wasn’t sure if it was real or not. But Will remained on the tracks as the train pulled away, and it looks like he’s left alone with only the Wendigo and his imagination. Although Will and Chiyoh's scenes were beautiful and cloaked in darkness, it started the episode a little slow for me. I'm not sure I understand Chiyoh's motivation for pushing Will, and why she's trying to kill Hannibal. Is it just revenge? Or because she has nothing else to do now that the prisoner she watched is hanging like a firefly in his prison? Meanwhile, Inspector Pazzi got the closest he’s been in years to his Il Mostro, as he confronted Hannibal in the museum where Hannibal was working. He got close enough to confirm for himself that Hannibal was the same killer he was searching for all those years ago. Unfortunately, he also got close enough for Hannibal to smell what he was up to. Pazzi decided to call in for the bounty instead of sending the police after Hannibal, and if he could have possibly escaped Hannibal before, he definitely can’t now. The first time Alana appears on screen, she is wearing a metallic silver blazer that sparkles like broken glass. She is not messing around, and she bosses Mason around like... well, a boss. They both take Pazzi’s call and make it clear that if Pazzi turns Hannibal over to Mason, he is sending Hannibal to torture and death. They give Pazzi their terms, and Pazzi agrees. “Hannibal’s going to kill him, you know,” Alana said. And kill him he does. When Pazzi returns to get Hannibal’s fingerprint as part of the bounty agreement, Hannibal knows he can’t let him go a second time. So, in the second OMG moment of the episode, Hannibal kills Pazzi in the exact same way Pazzi’s ancestor was killed for attempting to assassinate a ruler of Italy: he cuts his bowels and then hangs him outside the window. It is super gross. Hannibal is getting pretty brazen with his kills, and I doubt Pazzi would be the last inspector to call on Hannibal for information on the men who go missing around him, with no trace of their whereabouts. And I’m not sure of Hannibal’s plan for Pazzi, but hanging someone out the window with their intestines hanging out right after they question you is not exactly staying under the radar. Perhaps it was a way to make it look like a suicide, like Bedelia suggested, though it’s a pretty difficult and horrible way to go. I thought for a second that this might be when Jack catches him. I always fall for it, just for a second. But when Hannibal dislocates his shoulder, gets bloodied, and falls out the window, he survives and walks away. He is mythical in his ability to survive. I assume he is heading back to Bedelia — I mean, wouldn’t you? 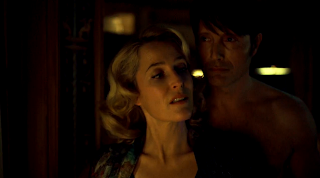 “Almost anything can be trained to resist its instinct,” Bedelia says as she stands close to a shirtless Hannibal with an expression that says she is trying very hard to keep herself from bolting out the door. Hannibal has mastered his instincts, and he excels in getting others to ignore theirs. After all, he got Will, Chiyoh, Alana, Mason, Jack, Bedelia and Pazzi to all want to get closer to him, and to ignore their instinct that says to get closer to Hannibal is to get closer to death. Gillian Anderson’s skill is on display again, as it always is. She can portray so many emotions all at once — you can see how she’s both terrified to stay and terrified to go. She must still be amusing Hannibal because she’s still alive, but how long can she truly last in Hannibal’s lair, with him in her head? Everyone looked amazing in this episode, as usual. The style on this show just kills me. Seeing Jack spread Bella’s ashes and talk about being in Italy without her was so sweet and sad.